I found Special Collections during a historic preservation and public history internship shortly after graduating from undergrad with my degree in History. In the course of conducting research for a preservation project, I sort of stumbled into archives and shortly thereafter special collections librarianship. It was exciting to find a profession that brought together service, education and history. What excites me most about special collections librarianship is the movement towards making it a more inclusive and diverse--both in terms of the bibliographic objects and the make-up of the individuals in the profession. I really appreciate the strides organizations such as Rare Book School is making towards including more non-Western materials and formats into bibliography. Houston Beyond Convention: The Photography of Ben DeSoto, 1980-present reflects on nearly four decades of work, past and present, produced by Houstonian Ben Tecumseh DeSoto, whose career spans genres of photography and a diversity of human experiences. After discovering his love for what he has called the “scientific magic” of the photographic process, DeSoto followed his passion for photography to a career chronicling his city. DeSoto has consistently challenged the viewer to see beyond static images of Houston, to look more deeply instead at the individual or community narrative behind the photograph. 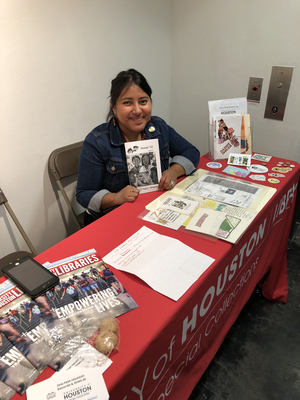 Presented thematically, the exhibit showcases DeSoto’s documentation of Houston: portraits of local visual artists and musicians from fringe music and arts scenes, fine art photography, journalism, as well as his life’s work, the Understanding Poverty Project. Through photographs, news clippings, and audiovisual materials, Houston Beyond Convention: The Photography of Ben DeSoto, 1980-present tells the story of Houston--across class and race--and forces the viewer to move beyond conventional thinking. Favorite rare book / ephemera that you've handled?